There are places in every city that qualify as hidden treasures. South Bend, a modestly-sized Midwestern city just 90 miles from Chicago, has quite a few such distinct locales. They are often barely out of plain sight. One of the most stunning views of South Bend is a quaint park just behind the city’s convention center. Island Park at Century Center is a small plot of land with an outdoor music space. Concerts are held regularly during summer months. It has generous amounts of seating, a relaxing atmosphere, and gorgeous views of the St. Joseph River. 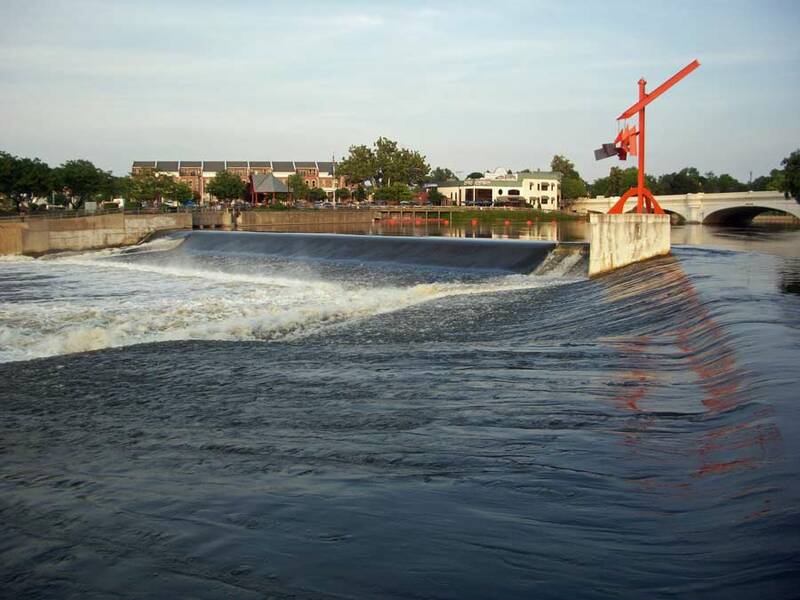 South Bend’s man-made waterfall serves as a focal point of the meeting of man and nature. Island Park is not in the most readily accessible location. It is literally hidden in the shadow of the Century Center. It can be accessed either through the convention center or along a ramp next to North St. Joseph Street and E. Colfax Avenue. Once down the ramp, a bridge connects a quiet and shaded area known as Pier Park to Island Park. Pedestrians lucky enough to happen upon Island Park are in for a visual treat. Here are just a few shots that I took of both Island Park and Pier Park, which is just to the north. South Bend Voice is committed to civic and multi-cultural learning. As part of that mission, we are delivering a series of articles titled “Rediscovering South Bend” to highlight hidden treasures in our community. The city’s rich history provides ample opportunity to uncover our past and look forward to a promising future.